The ideology of market freedom achieves its fullest expression in an authoritarian state. The regulation of market processes in the United States and Western Europe after WWII suppressed the authoritarianism inherent in capitalism. The reduction of state controls over capital that began in the 1970s initiated the liberation of that authoritarianism. The emergence of finance capital, so-called financialization, brings to full expression the anti-democratic nature of market processes. In the first decades of the 21st century finance capital has asserted its dictatorship over a globalized economy. This lays the basis for the transition to overt authoritarianism thinly disguised by democratic trappings. Capitalist competition is the vehicle that transforms democracy into dictatorship. Well into the twenty-first century it is difficult to find a major country in which democratic institutions are not under stress. In the United States the government has fallen under the control of a profoundly anti-democratic regime. In Europe long-standing authoritarian tendencies have enjoyed a quantum leap under the neoliberal austerity regime fostered by the German government through the European Commission. The draconian austerity measures that were imposed on Greek citizens after 2010 represent an obvious and shocking example of the mainstream authoritarian trend in Europe. Authoritarian movements and political parties hold power in Poland and Hungary. Successive elections in 2017 brought a surge of far-right movements: 1) the neo-fascist party Alternative for Germany that deepens the crisis of the centrist parties; 2) near elimination of the center-left by the victory of a hard-right government in Austria; 3) imposition of direct autocratic rule in Catalonia by the right wing Spanish government; and 4) the electoral triumph of a right-wing billionaire in the Czech Republic. Outside the EU the efforts of the government of Europe’s most populous country, Russia, to undermine democracy domestically and in the rest of Europe are well-documented. The few developments supportive of democracy come in Spain, with a center-left government and progressive and participatory Podemos a strong political force; and the shift of the British Labour Party to social democracy and the imminent possibility of an election victory. These sources of hope guide and inspire progressives in Europe, but have yet to move into government. Beyond North America and Europe no major country counters the authoritarian trend, not China, where the government oversees a transition from socialist to market authoritarianism. Superficial flowering of democratic participation in Brazil and India proved short-lived, with a far-right president elected in the former, and the Indian government fostering ethnic-religious intolerance. In Viet Nam an authoritarian government has completed the transition from central planning to capitalism though slightly less repressive than in China. The Philippines, its democratic institutions dubious in the past, now suffers under one of the most brutal regime in Asia. What is its source of this near universal 21st century tendency to authoritarianism? The end of WWI, now 100 years past, ushered in the rise of authoritarian regimes provoked by the excesses of capitalism. The Great War was the most catastrophic conflict in human history. Ten years later came the most devastating economic crisis the world had known. The excesses of capitalism and the apparent incapacity of representative governments to contain those excesses induced many, especially in Europe, to dismiss “bourgeois democracy” as degenerate and dysfunctional. As the Great War ended, revolutionaries in Russia overthrew capitalism and pledged a governance system in the interests of the working-class and peasantry. The promise and hope for popular democracy went unfulfilled as the workers’ state transformed into thinly disguised authoritarian rule. In the wake of economic depression, fascism, war and consolidation of the Soviet Union whose military had borne the major burden of the war against fascism, there developed a near-consensus among mainstream political parties in the United States and Europe. 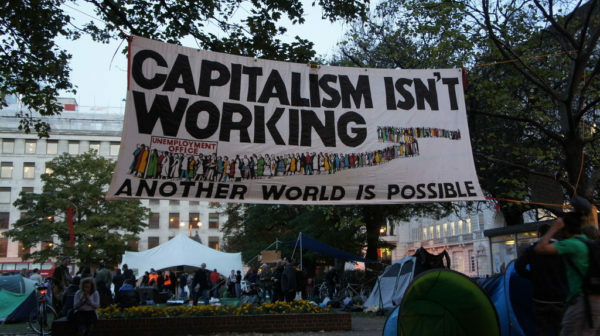 Thirty years of economic catastrophe, dictatorship and war demonstrated even to major elements of the capitalist class the need to manage capitalism. During its brief life this consensus maintained that stability and consolidation of capitalism required control mechanisms to prevent the excesses of the economic system, excesses generated by competition, what Marx called “the inner nature of capital”. The rise of financial capital, which began in the 1970s, returns us to the capitalist authoritarianism that flourished in the 1920s and 1930s. Market competition is the source of authoritarian rule, and by its nature competition among oligopolies extends into social and political conflict. It is too narrow and insufficient analytically to treat competition, the movement of money capital, as exclusively or even primarily an economic process. It is important to use the term “re-regulation” not “de-regulation.” During the New Deal period and the European post-war social democratic and Christian Democratic consensus, governments regulated capital in the specific sense of limiting its freedom of movement. Tariffs, non-tariff “barriers”, limitations on conversion of national currencies and strict oversight of financial institutions constrained the form and intensity of competition. The explicit purpose of these policies was to prevent the “free flow of goods”, to restrict capital’s cross-border mobility, and narrowly contain financial speculation. Neoliberals do not aim at eliminating competition-restricting regulations. Neoliberal re-regulation replaces regulations on capital with different legal rules, ones that actively facilitate the collective power of capital and undermine the collective power of labor. Neoliberal re-regulation does not negate of restrictions on capital. Rather, it is the implementation of active policies to limit the scope for governments to act and intervene in economic, social and political spheres. During the New Deal and social democracy in Europe governments regulated capital. In the neoliberal era capital regulates government. Citizens in the advanced industrial countries, especially the United States and the United Kingdom, have reached the point at which private power is stronger than our democratic state. This private power manifests itself in unconstrained financial greed that over-rides democratic decisions, justified by an ideology of self-adjusting markets. Rejection of that ideology requires radical reform to prevent financial capital from creating fascism. To prevent fascism we must implement a citizen’s arrest of capital that will liberate the many not the few. John Weeks is an emeritus professor of economics in the Department of Development Studies at SOAS University of London. This article summarizes John Weeks, “Free Markets and the Decline of Democracy,” Review of Radical Political Economics 2018. Image: Occupy London protest in London, UK, on October 23, 2011. Photo by James Mitchell.